A venture studio. An incubator. A co-working space. Rhubarb Studios was all of those things and more. It was a lab for crazy ideas and wild notions of innovation, which proved to be the perfect environment for my transition from UX student to practitioner. Rhubarb Studios was established in Downtown Los Angeles as a venture studio that brought together entrepreneurs with promising ideas and paired them with teams assembled specifically to help build the vision. Because Cleu was operating out of Rhubarb Studios, I was fortunate enough to be exposed to the progressive ideas that were foundational to the product design & build process. I ended up dedicating UX design time to two different teams (Kraver & SHFT), as well as mentoring incoming UX designers. Having gone through the Rhubarb process of helping build Kraver (more on that below), I felt comfortable explaining to incoming UX designers how things worked in the studio. While there was still a user-centered design approach, the studio relied heavily on a Lean UX methodology. With it's foundations in design thinking, agile development, and lean startup product design, lean UX helps designers focus on building and testing with users, cutting out any wasted time and extraneous documentation in the process. Often this would prove as a jolt to incoming designers. In order to ease their transition, I would often assist the various teams when they were in a jam. As a mentor in the studio, I also ran the UX guild standups each day and presented workshops on topics such as iterative wireframing, navigation & information architecture, and collaborative sketching. While these sessions were conceived with UX designers in mind, they were open to all. The final role I played as a Rhubarb Studios mentor was assisting in the evaluation of incoming UX designers. To do this, I ran the designers through a three hour design thinking exercise that mimiced the various phases they would be facing should they be chosen to work on a studio product. 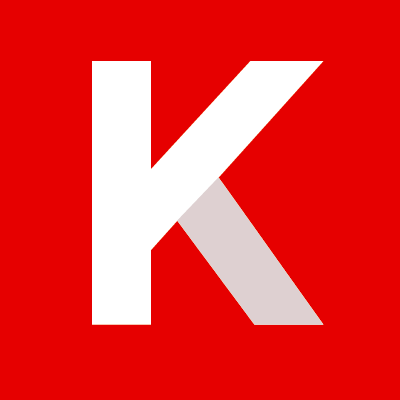 Kraver entered Rhubarb Studios hoping to solve a specific problem within the large and highly competitive food app vertical. They had plans to create a tool that facilitated the ordering and payment of food at any fast-casual restaurant. Starbucks was just achieving success with their closed-system order and payment platform and Kraver was looking to expand on that. Kraver's ambitions were intense and complicated. With a goal of enabling ordering at any fast-casual dining location, the application would need access to all menus and the various modifications that could be done. This wasn't just a list of burgers. The app would need to know what goes on a burger and allow the user the ability to customize to taste. Additionally, in order to meet the vision of the product, we would need to tie into each restaurants point-of-sale system and allow for mobile payment. This would prove to be one of the more ambitious products I have worked on. Keeping my training in user-centered design in mind, my approach to this challenge, as well as that of SHFT, was to learn and adopt a lean UX methodology. The goal was to learn quickly so that we could begin testing, learning more, and iterating on the design. Once the stakeholder interviews wrapped up, we turned our attention to who the users of this application would be. By constructing empathy maps as a group, we were able to tap into the mental model that each teammate had regarding the users. The next step was for me to validate our assumptions and conduct interviews. Through our empathy map, we identified two proto-personas for the application: the restaurant diner and the restaurant manager. After a series of interviews, the personas became defined. We decided to focus on the diner first by creating a robust recommendation engine, and then bring in the manager when expanding to payment. I was introduced to quite a few tools, practices, and techniques during my time at Rhubarb. The Business Model Canvas was one of those tools. By illustrating and organizing key pieces of the business on the canvas, the team was better able to see points of opportunity and address assumptions we each had regarding the true value of what we were building. There was no doubt that the field of food apps was competitive. But was it too competitive? Was there any "blue sky" left? As we began exploring the various applications, there appeared to be a few cracks of light that seemed worth exploring. For instance, no one was exploring customer generated content in the form of line wait times for pickup. Perhaps we were on to something. As the concepting stage began, the team needed to come to a conclusion on the tech stack we were going to employ and the APIs we were thinking of using. I led the team through a storyboarding exercise, playing the role of our customer, and had the team shout out what was happening on the backend at each stage. It was a quick way to get everyone's thoughts out in the open so we could move forward. Once we had our tech interactions (somewhat) thought out, we engaged in a design studio exercise of rapid sketching. From those sketches a list was made of common recurring elements which helped give us direction to move forward. We began breaking down the features into agile story cards that would then be turned into stories in Pivotal Tracker. 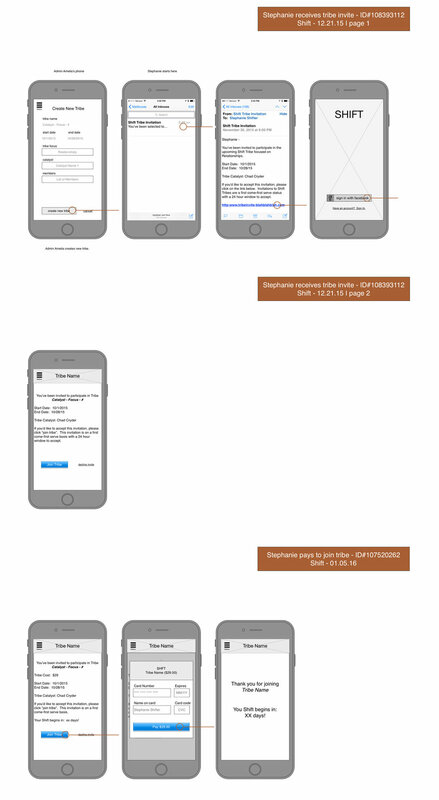 Following the practice of mobile first, I started wireframing the Kraver mobile experience. Because the team was working together around a table, the wireframes were iterative (built just in time and story specific) and contained few annotations. Because there was to be a second user experience from the restaurant manager's perspective, we also discussed the desktop version and how/if it would differ from mobile. I created a few samples to help show that there would be little difference at this stage. As foundational pieces of the application were being built, the team was concurrently running tests on how best to make successful recommendations. We built a concierge model of the application by stringing a number of services together and playing a "wizard of oz" role of magic behind the curtain. Also during this time, the stakeholders were having meetings with potential investors in the company. Though we didn't have much done, we had an idea and a story we could present to those who were interest. Based on that, I built a prototype we could talk about in order to gauge interest and solicit valuable feedback. After five weeks, Kraver exited the Rhubarb Build program. We had validated interest through our MVP concept testing and the stakeholders felt they were on the right path. 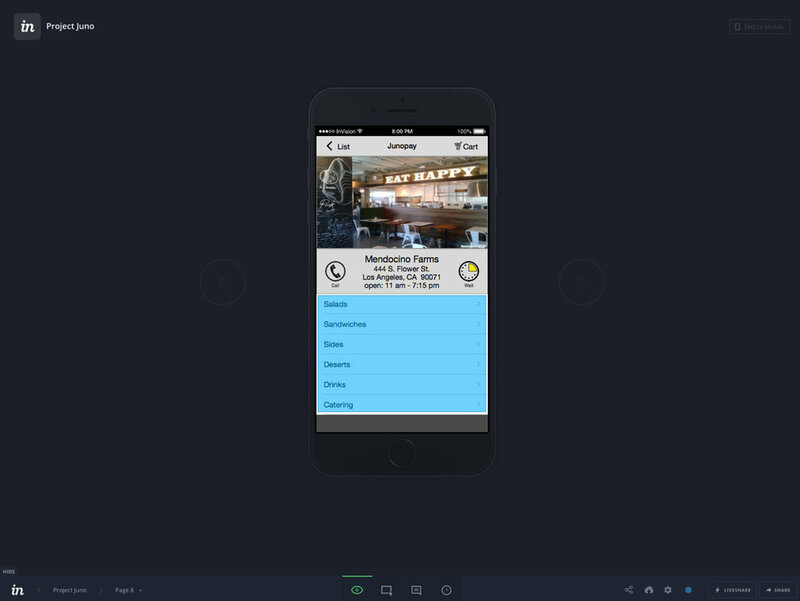 After they left the program, Kraver decided to pivot away from an iOS application and has reinvented itself as a Watson-powered food recommendation bot that lives on the Slack platform. I'm excited to see how their story unfolds. SHFT was born out of the partnership between entrepreneurs John Kim and Taylor Adams. Based on John Kim's wellness philosophy and it's foundations in his brand, The Angry Therapist, the goal of the SHFT application was to "change the way we change." Unlike most of the products that came through Rhubarb, SHFT had hundreds of users and potential advocates ready to go from the beginning. John had attracted thousands of subscribers to his numerous social channels, many of which were participating in a private Facebook group. The team faced two prominent challenges with SHFT. Could we essentially recreate a robust social network, and how would that platform need to be designed in order to meet the needs of it's users? I began the engagement with SHFT two weeks into it's build cycle. User research and interviews had already been done, with an idea of who their main persona was. I quickly mapped out the current process as the product owner caught me up on what I missed. I also interviewed ten more users just to feel comfortable with our persona direction. Competitive analysis with SHFT was an ongoing process. As someone on the team would discover a possible new competitor, we would analyze their offering, run it through a heuristics and features audit, and come to a conclusion as to whether or not they were a service to be reckoned with. Because life coaches are an integral ingredient to SHFT, we felt we were on to something unique. One of the main themes that would come up during the interviews was group size. The team needed to figure out how large a Tribe (SHFT group) should be in order to create an impact. Also, how would Tribes be formed? These were just a couple of the concepts I worked through. As we were building the application, we were running an MVP to test the concept (more on that below). I created this map to help explain what was being built and how a concierge service could be used in conjunction with the various cycles. As with the previous product (Kraver), wireframes were done in an iterative fashion and attached to specific stories in Pivotal Tracker. Through the collaborative process of story grooming, if there was any confusion, the team would discuss what the users needed and I would adjust wireframes accordingly. 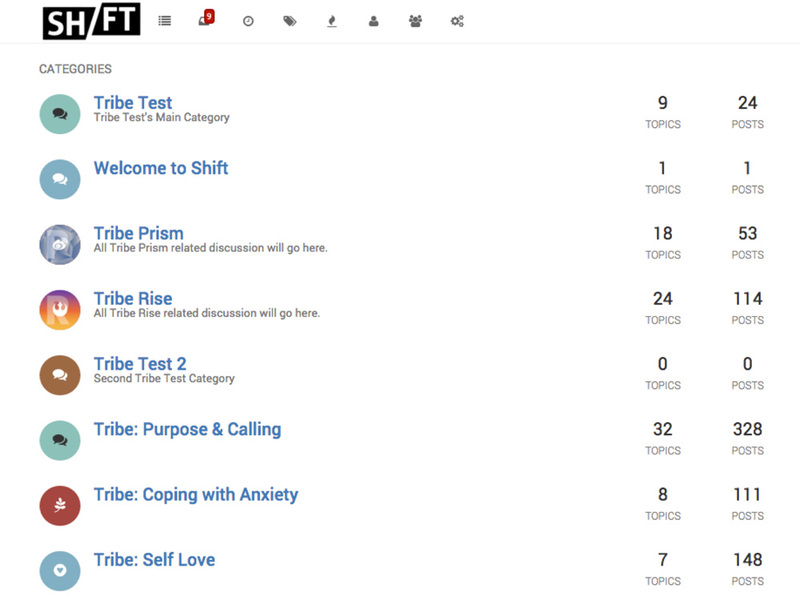 As the build was happening, we were hosting numerous users in MVP tribes. By focusing on the experiences of actual users we were able adjust the model in order to make it better. As tribe sessions would come to a close I would interview the users to get a sense of what was working and what wasn't. Aside from session exit interviews, we also tracked metrics on how engaged the users actually were. This was a highly motivated group of individuals with aspirational goals. By tracking what they were actually doing, and not relying solely on what they were saying, we were getting much richer feedback and insight into what was working and what needed improvement. With it's build process in full swing and a number of experiments under it's belt (and many still running), SHFT exited the Rhubarb Build program. They are well on their way to achieving their mission of changing the way people change. The experience of helping build this great product has changed the way I do things as well. Looking back on my time at Rhubarb Studios, I'm absolutely amazed at how much I learned and gained from the experience. It was an adventurous place that offered valuable insights from every direction. I can't think of a better way to test out the theoretical knowledge I had gained from school than by applying it to solve real challenges in that studio.